This FAQ is a result of the tremendous amount of questions I receive about airbrushing. Every few days someone asks the same questions on almost every discussion board or Facebook group, "I want to buy an airbrush, what would you recommend?". To be honest, answering the same questions all over again has become frustrating. I stopped repeating exactly the same answers. I don't know what is the reason of these returning queries. The ability to search for information online is in decline? This is why I have decided to create a sort of a FAQ about the airbrush. I gathered all the most repeated questions and answers in one place. As it turned out, many of the questions have been already answered by me on the blog in the past. You have seen many of the pictures before. The material below are mostly my opinions on the subject, the result of a couple of years of experience with the airbrush. If you have question that are not yet in this FAQ, leave them in the comments. I will add them to the list and answer them as best as I can. This way the FAQ will stay up to date and become more and more useful to the readers. Please feel invited to join the discussion and sharing experiences. The English version was translated from Polish by Mikołaj. Polską wersję tego artykułu znajdziecie tutaj. 1.1.What nozzle size to choose? 3.What more will I need? 4.What else can come in handy? 5.How to clean an airbrush? 5.1.How to clear a clogged nozzle? We are only interested in DOUBLE ACTION airbrushes. This type of airbursh gives you control over the amount of paint supplied (front-back trigger movement) as well as the amount of air coming out (up-down trigger movement), which makes your work very precise. If you're short on money, you may buy a Chinese copy of an Iwata airbrush. This is how I started my airbrushing adventure. 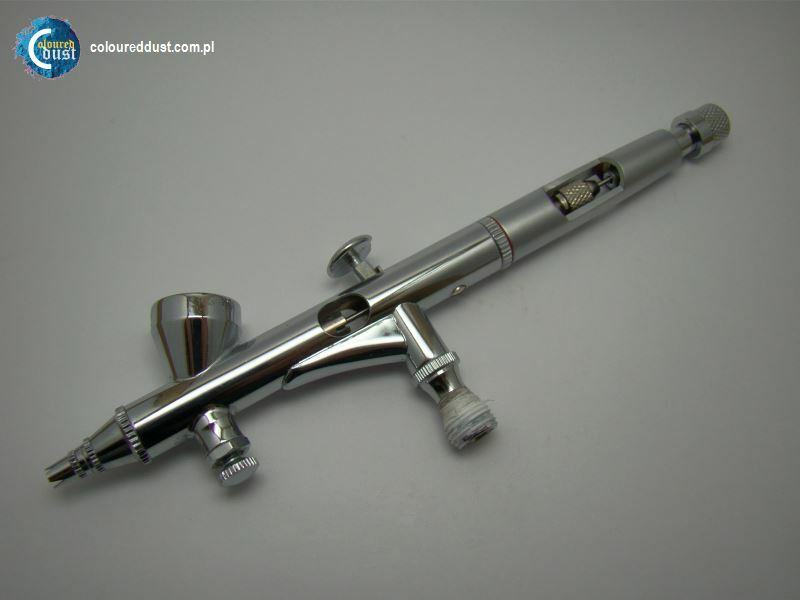 In my opinion, the best Chinese airbrush available on the market at the moment is the Airbrush BD-208 (Chinese K208). Follow this link to read a thorough review. 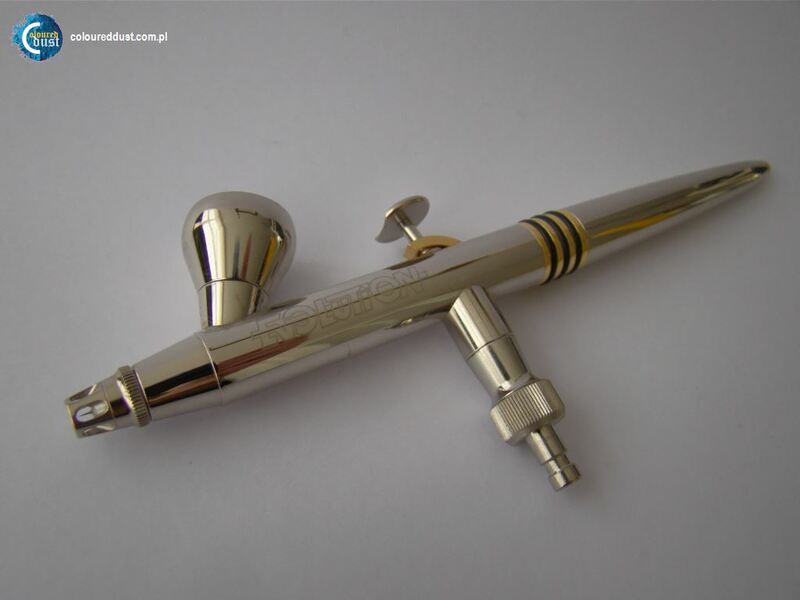 If you are able to spend a little more money, consider buying a German-made Hardeer&Steenbeck airbrush. These are high quality tools and they are designed differently from Iwata. Spare parts are quite affordable. One of the more interesting models is the "EVOLUTION 2in1". Follow the link to read a thorough review. If you make up your mind for an Evolution airbrush, think of saving a little more money and buying the "EVOLUTION AL plus" version. It is made of aluminium and incredibly light. It weights only 53g and has some interesting features. Follow this link to read a thorough review. The highest model from the Hardeer&Steenbeck airbrush family is the "Infinity CR plus". It has all the features H&S have ever invented for their airbrushes. It is a legend on its own in the painters and scale modellers community. Unfortunately it is the most expensive airbrush from this German producer. 1.1 What nozzle size to choose? I find the 0,2mm nozzle the most universal. I used this size in 99% of my work. Bigger sizes like 0,3 0,4 or 0,5 can be used for priming or painting large areas, like for example gaming terrain. 0,2mm nozzle from Hardeer&Steenbeck with a teflon oring. Using a 0,15mm nozzle takes some practice. It is really tiny, so it gets clogged easily. I wouldn't recommend it for your first airbrushing experience. You might be forced to clean it very often, which might discourage you from using the airbrush. In my opinion, the Chinese AS-186 is the optimal solution. You can easily buy it on ebay for less than 100 Euros. With that price tag, it's really quiet. It has a gauge, a filter and most importantly, a 3-liter air tank. This tank will prevent the compressor from overheating and will keep the engine quiet during breaks in between painting. 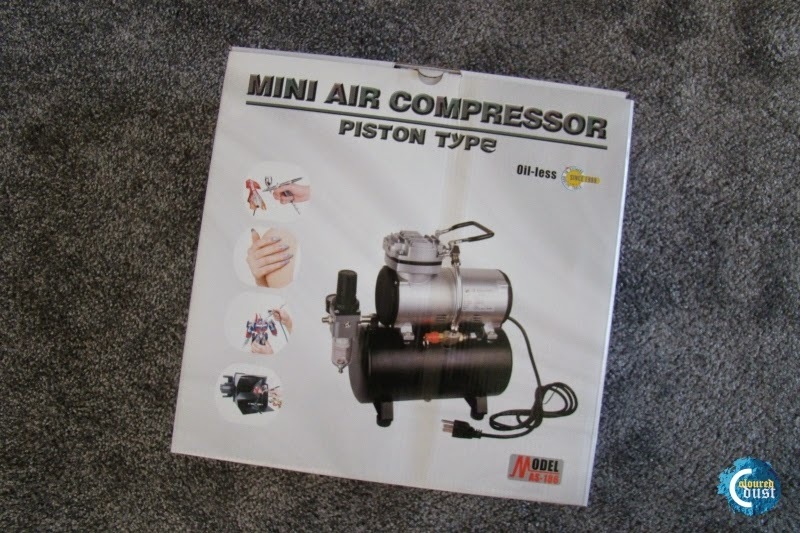 Do not buy a compressor without an air tank! 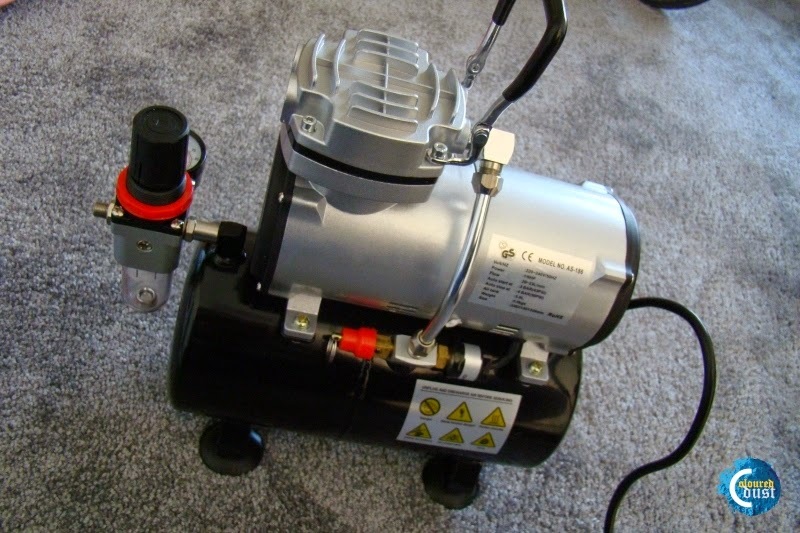 If you are willing to spend more money on a compressor, you might consider buying a custom-made one, built from a refrigerator compressor. These are very quiet and often built from high quality components. Unfortunately they are expensive. 3. What more will I need? 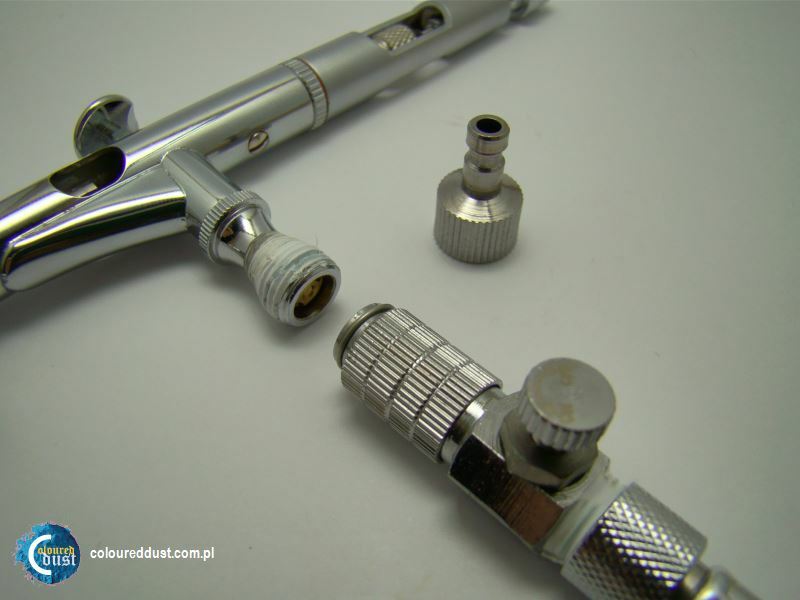 If the compressor you bought didn't come with a hose with which to connect the airbrush, you will have to buy one separately. Most of the times these come with a 1/8'' thread. There are a variety of lenghts available on the market. The longer, the better. 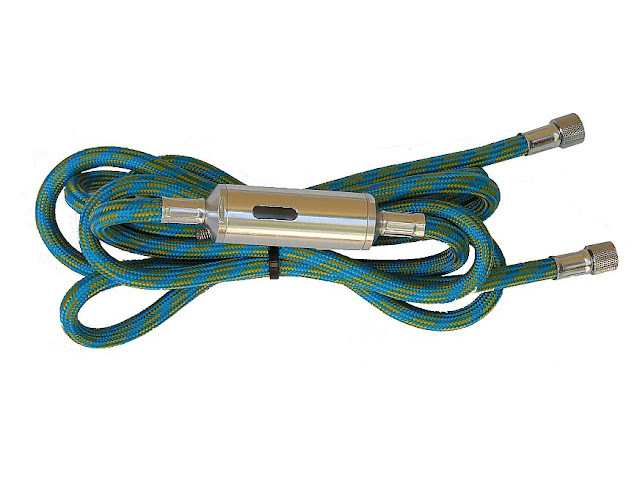 A long hose is an additional air container. A hose with a built-in water trap is a very nice idea. I personally use a 3m one of this kind. An airbrush cleaning pot is an essential piece of the workshop. 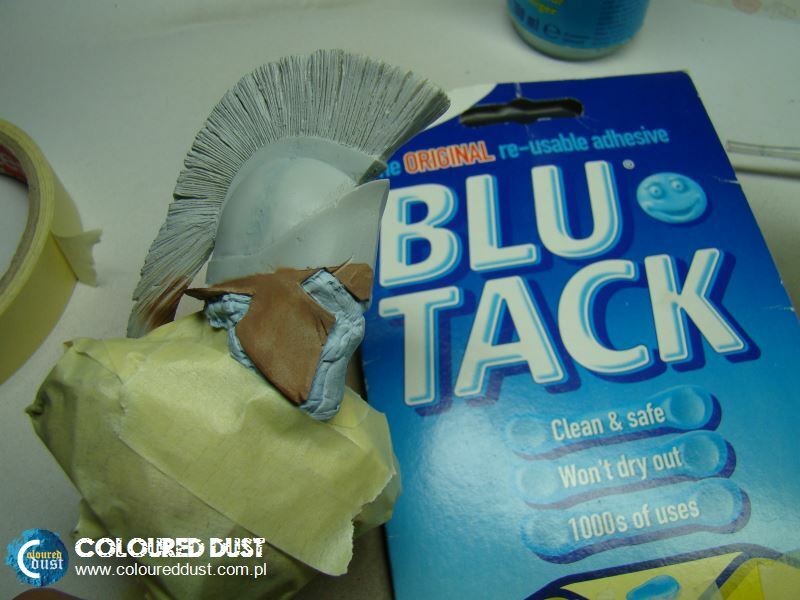 It is used when you need to get rid of any leftover paint from the airbrush and during cleaning. Don't be cheap, it isn't very expensive (about 8 Euros). You can make one for yourself too, of course. 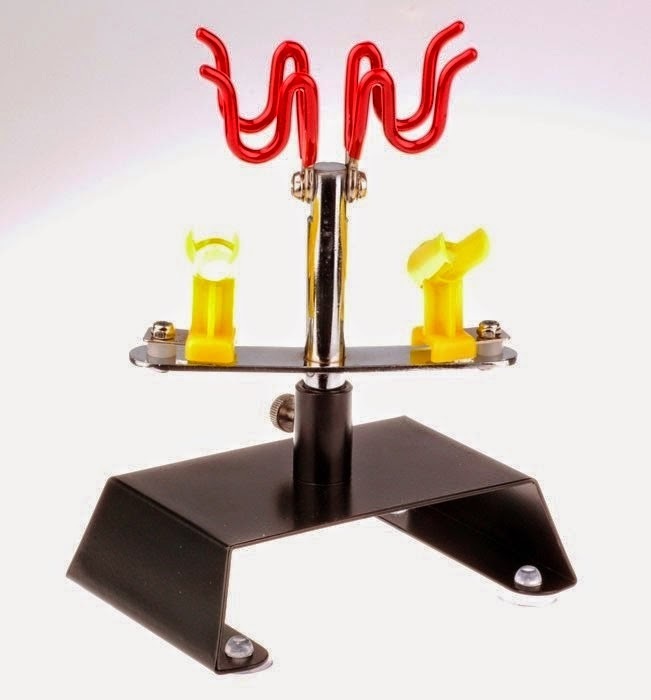 However the best option would be to buy the one with an airbrush stand. These pots also have a filter which keeps the fumes from paint and solvents inside. Special "pipe cleaners" for airbrushes will let you get rid off dirt easily. An additional usefull tool is the nozzle cleaning needle. It helps to scrub out dry paint leftovers from the nozzle. Use it very carefully! It can easily damage the nozzle, if used in a wrong way! 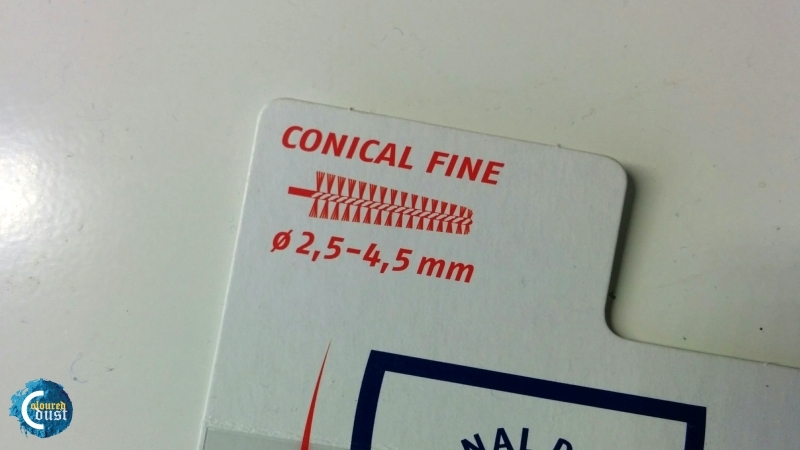 If you don't have a needle like this, you may use the needle from the airbush (supplied with the nozzle). Below you can see photos of a Chinese-made needle. If you own a Hardeer&Steenbeck airbrush, you might consider buying a dedicated cleaning kit (H&S-117400). 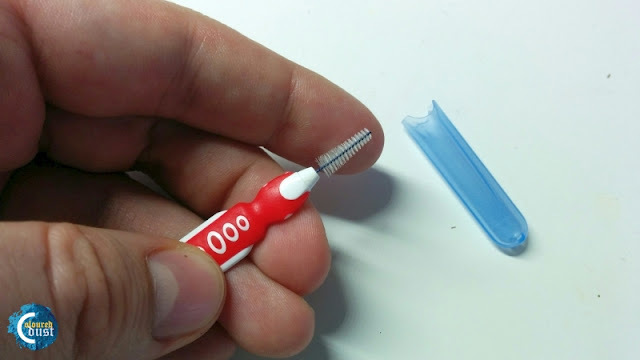 The needle is perfectly suited for cleaning 0,2mm nozzles and wider. The cleaners also fit inside the inner canals of the airbrush. Cotton buds are cheap and very useful. Soaked in solvent, they are perfect for cleaning the airbrush. They also do a very good job of cleaning leftover paint from the nozzle and needle cover during painting. 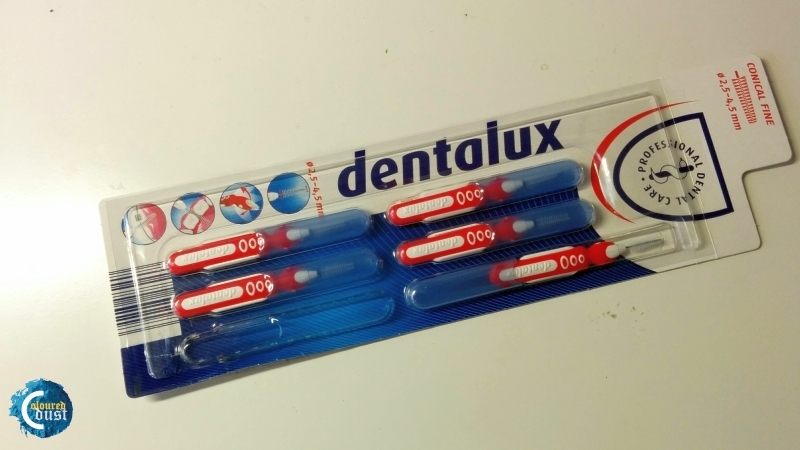 Cheap version of cleaners are buds to clean the interdental spaces, in the shape of a cone. You can buy them at a drugstore or popular discount stores like Lidl, Aldi. There are various thicknesses. You can use any acrylic paints but they will need thinning down to proper consistency. It is a good idea to begin with buying a couple of bottles dedicated for the airbrush. 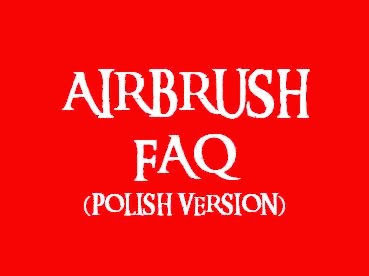 This will help you know the proper consistency of an airbrush ready paint. These paints are supplied by for example: Vallejo, AK Interactive, AMMO, Golden. They differ in colours, type and thickness of pigment as well as consistency. You might consider buying a paint set. I personally recommend Vallejo paints and their Air range. Their latest and in my opinion very good product are the Game Air paints. Red the review HERE. 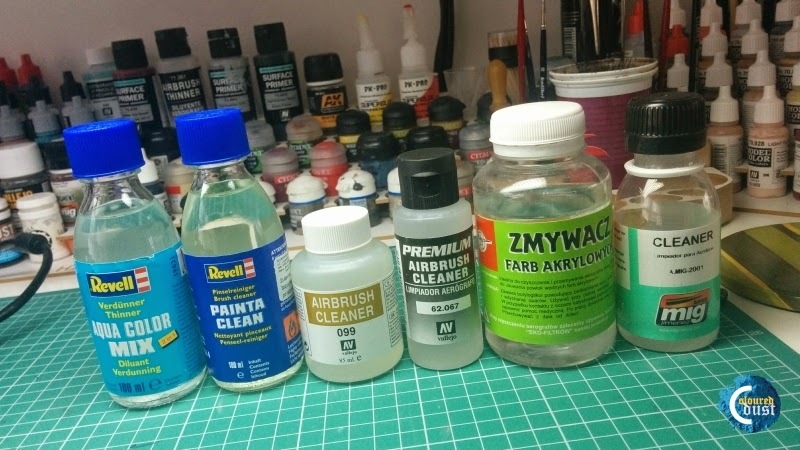 Acrylic paint thinner is essential for using an airbrush. It allows to dilute the paints to proper consistency. Sometimes it might come in useful for fixing the consistency of airbrush-ready paints. There is a variety of brands. They differ in ingredients, smell and how they work. 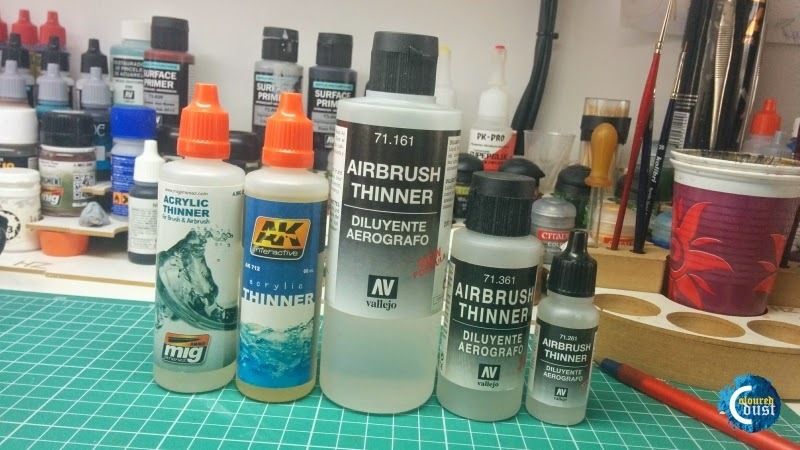 I prefer the Vallejo Airbrush Thinner (New Formula). Some modelers use to dilute a water. Another use special mixture of water, drying retarders and finally Sidolux. The question is why? A dedicated thinner is composed of all we need. Average bottle (60ml) was enough for me from two years. A painted quite a few figures. So it is not a big expense. An airbrush should be cleaned on a regular basis. Take good care of it. Many problems during airbrushing are caused by the airbrush being dirty. For cleaning you will need acrylic paint removers or a dedicated airbrush cleaning fluid. They come in many varieties. They differ in price, smell and power. Be careful with highly corrosive substances! They can dissolve the rubber orings inside the airbrush. You don't have to worry about that, if your airbrush has teflon washers. A pipette can be used for example to put solvent inside the airbrush cup for cleaning or when switching between colours. 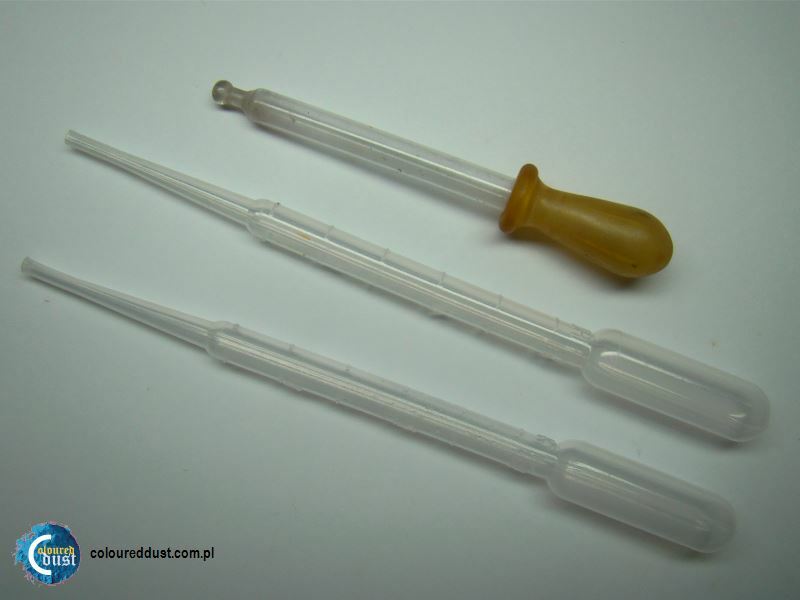 You can buy an eyedropper at a drugstore, if you don't have access to plastic pipettes like these. You could also use a syringe. Latex gloves (non powdered!) will protect your hands from paint during painting. This will save you some craping afterwards. An apron may also protect your clothes from getting dirty with paint or solvents. It is useful also while brush painting. 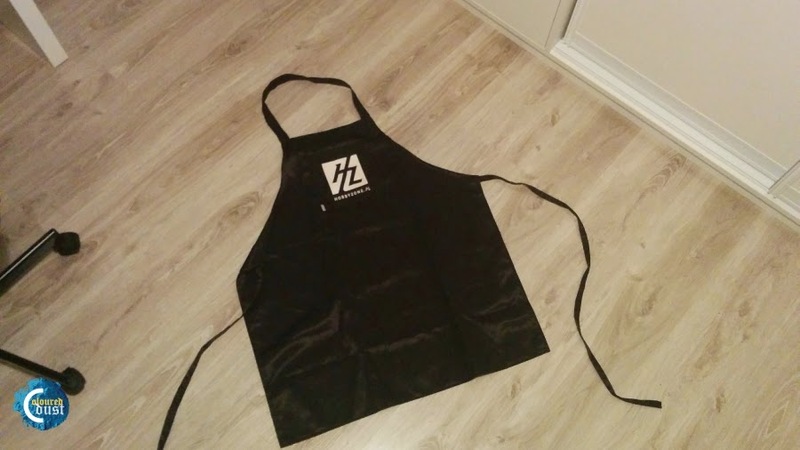 I use a HobbyZone apron made from special material. 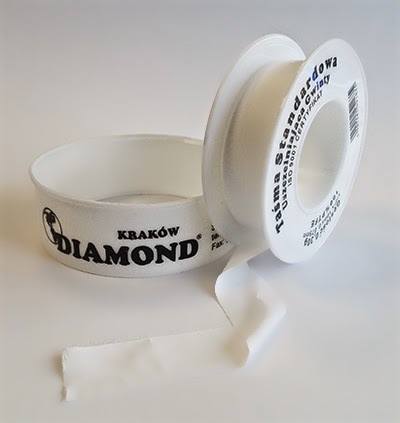 Teflon tape is essential for sealing threads in connections between the hose, airbrush and compressor. Use it also in any additional connections to the hose. This type of sealant is recommended by compressor manufacturers, all necessary information is often provided inside the instructions manual. Teflon tape is available in every DIY store. 4 What else can come in handy? You can clean your airbrush using an ultrasonic cleaner. Read about it here > How to clean airbrush using Ultrasonic Cleaner? It is a quicker, more comfortable and more thorough way of cleaning. 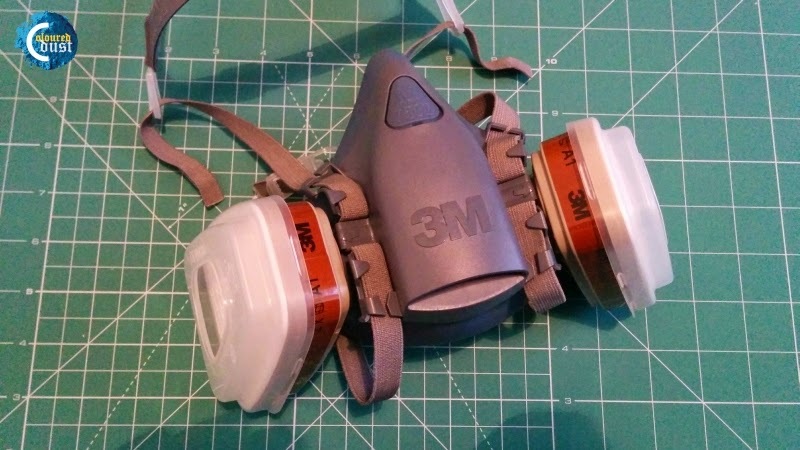 Masking (partial covering) is an essential technique used while painting miniatures and models to avoid getting paint on areas you want to leave clean. You will find all necessary information on this subject in my article here > Airbrush - Masking Techniques. In the following article you will find information about a special masking putty - Incredible Masking Putty (PK-PRO). There is a fair amount of fumes from paints and solvents in the air during painting. You would not like them getting inside your lungs. To avoid this it is a good idea to buy a mask. 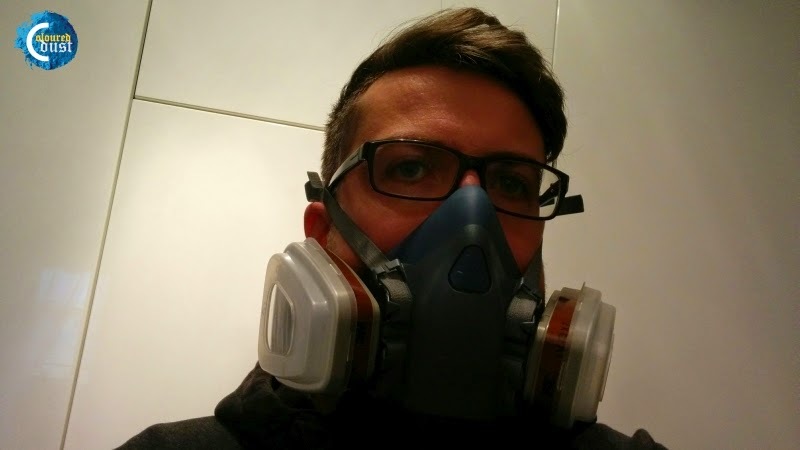 It pays to get a comfortable and safe mask like the 7500 from 3M for example. It uses professional carbon filters. Remember to replace them regularly. The dust from painting is present everywhere in your painting area. After it settles, you can find your desk covered in paint. Some painters use special spray booths or ventilation to blow the fumes and dust outside of their room. I don't use anything like it. 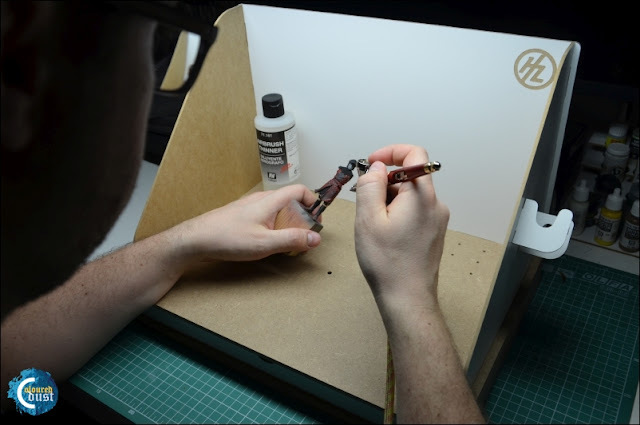 An interesting solution is also "Airbrush Station" without a exhaust. 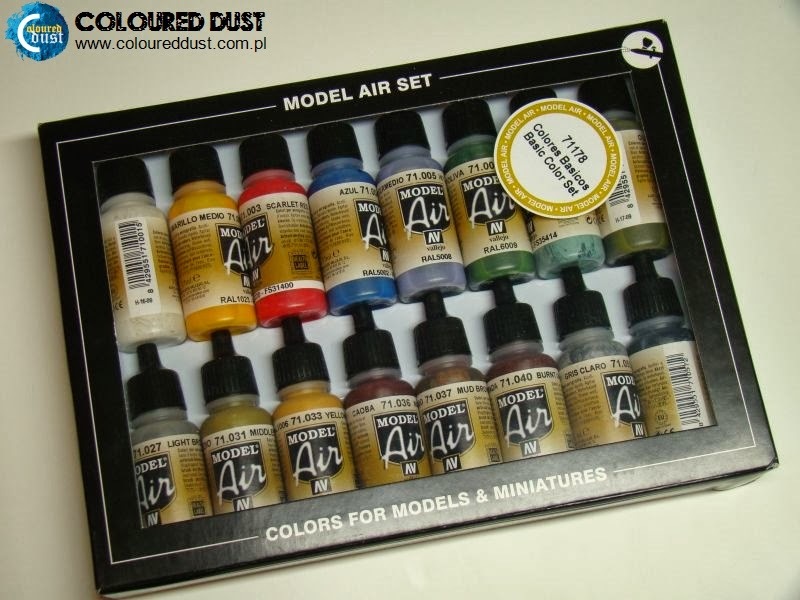 I've review this product here - Airbrush Station - Hobby Zone (HZ-as1). If you're looking for more information and want to learn new airbrushing skills, you should use the right sources. One of them are DVD guides. For me, the best thing so far is AK Interactive - AIRBRUSH ESSENTIAL TRAINING. It is a sort of "video FAQ" including everything you need to know on the subject. A special plug allows for a quick connect and disconnect of the airbrush to the hose. We don't have to use the thread on the airbrush every time. Just plug it in using the quick connect. This is especially useful when using more than one airbrush. Some of the connects come with a pressure adjuster built in. You don't have to reach to the compressor every time you want to adjust the amount of air coming through the airbrush. This is one of those things I can't imagine working without. 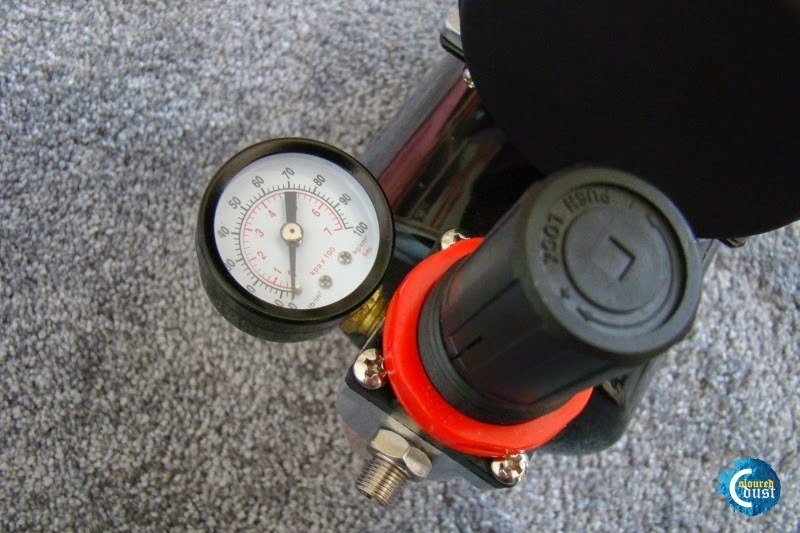 A quick connect with a pressure adjuster. When not using your airbrush or while preparing to change the colour of the paint, you need a place to put it away. That's where an airbrush stand comes in handy. There are many stands available on the market. In my opinion the cleaning jar described in paragraph 3.2 of this FAQ does the job very well itself. One of many advantages of owning an airbrush is the possibility of applying surface primers on miniatures and models with ease. It provides a very even coat. You can easily access all nooks on the model. There are a variety of primers available on the market from different producers. These primers usually don't need any additional diluting. We simply pour them into the airbrush cup and spray them on. The number of different primer colours readily available can significantly speed up our work. 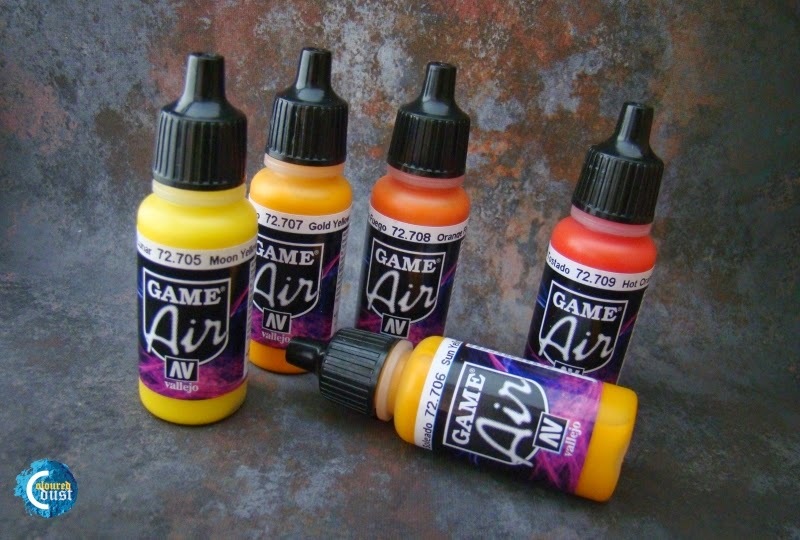 Using primers from an airbrush will also save you money, as it is cheaper than using spray cans. Remember to always read the instructions on the package before using primers and follow them carefully (e.g. 24h drying time) to avoid paint chipping. Personally, I prefer to use the Vallejo Surface Primer. 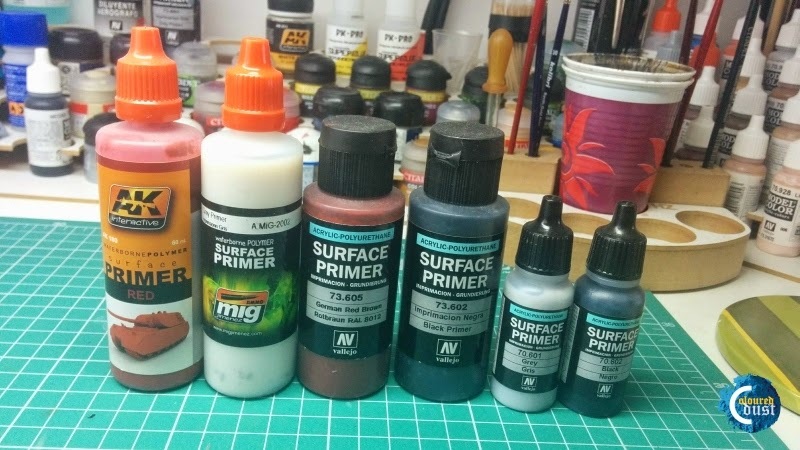 A selection of surface primers for airbrushing. 5. How to clean an airbrush? 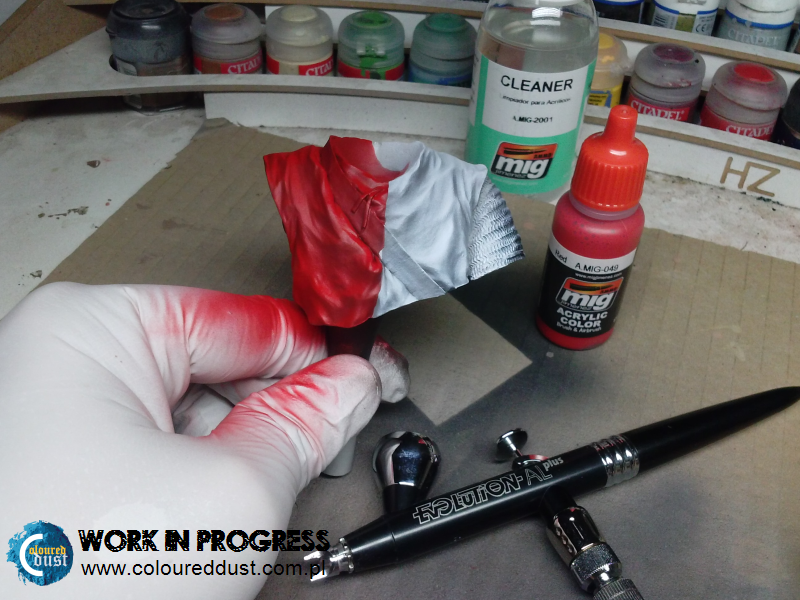 You can read about cleaning airbrushes in an article by Spell, posted on my blog. Click here > How to clean a very dirty airbrush?. You can also use an ultrasonic cleaner to clean your airbrush. Read more here > How to clean airbrush using Ultrasonic Cleaner? It sometimes happens that the paint goes dry inside the nozzle. This makes painting impossible. You may try to clean the nozzle with a special needle (see point 3.3). You have to be very careful though, not to break the nozzle. If this doesn't help, put the nozzle in a jar with solvent and leave it overnight. The dry paint should dissolve or soften enough for you to be able to remove it with the needle. Remember about using the right solvent, so it doesn't ruin the orings. Please remember that all of this I give you for free. It would be so nice if you leave a mark in the form of comment and share the FAQ to your friends. If you want to buy me a coffee or a beer the "DONATE" button is below. Świetna sprawa - cała podstawowa wiedza w jednym miejscu. Szacunek za ogrom pracy jaki włożyłeś żeby przygotować ten wpis i wrzucić go na bloga! Plan jest taki, żeby ten (i polski) wpisy żyły cały czas. Bede więc je aktualizował jeśli pojawia sie nowe pytania czy nowinki na rynku.